We, modern gamblers, are a unique bunch. With the creation of so many new games which you can play online, you realize the sky is the limit and you are in for lots of fun. With cool design, cascading reels and up to 50 free spins, Invaders from Planet Moolah slot machine is no exception. Invaders From the Planet Moolah made its debut in land casinos and only recently made its way online. 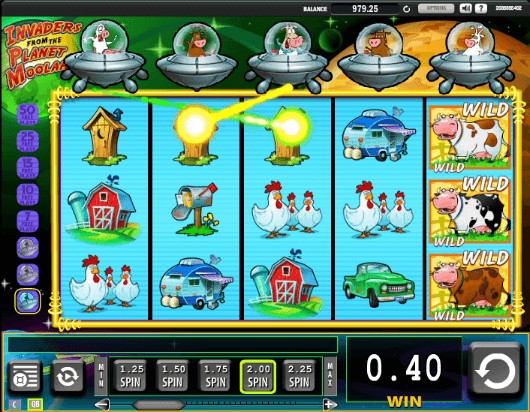 It is an alien themed WMS slot machine, only that in this case, the aliens are cows. They cartoon-ish graphics are quite nice and unique. The farm theme is present in every aspect of its design, as an example of this you will find galaxy background images along with pilot cows. Wait, pilot cows? Yes, and they control flying saucers. The highest paying symbols are the Wild Cows, Jackpot symbol and the Mixed Grandpa, Grandma, Dogs, Man and a Cowgirl. Cascading reels is not a new feature in slot machine world, but just in case you haven’t encountered them, it works like this: When you get a winning combination on the reels, the winning symbols disappear from the reels (destroyed by the alien cows) and new symbols fall into their place creating more winnings opportunities. Invaders From the Planet Moolah slot machine is a relatively simple game and offers only one special bonus feature, which is the Free Spins. 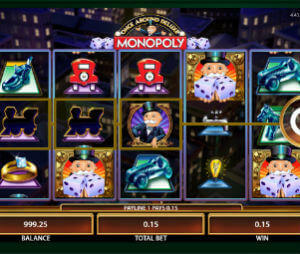 To trigger it, you will need to get 4 consecutive cascading reels at least, which will give you 7 free spins. Five consecutive cascading reels will give you 10 spin and so on up to 50! There is a meter on the left of the slot which shows you how many cascading reels you had. This Feature may also trigger randomly at the end of each spin and award 7 free plays. Invaders from Planet Moolah is fun and simple slot to play. The farfetched theme is quite cool and also the cascading reels. This is a low variance game and it won‎’t make you a millionaire, but it pays often and fun to play. If you wish to play Free WMS Slots, you can try our Free OMG Kittens Slot, her on SlotMachinesOnline.co.